Pioneers in the industry, we offer aluminum foil tapes and copper foil tape from India. Aluminum Foil Tapes offered are quality foil tapes that find application in areas requiring resistance from moisture as well as chemicals, thermal conductivity, heat & light reflectance, weather-ability and flame resistance. The available benefits include high thermal conductivity for maximizing process efficiency of heating/cooling, superior heat reflectivity for protecting temperature-sensitive materials against damages from heat, protecting parts from flame damages as well as in sealing and protecting sensitive surfaces from dust and moisture. 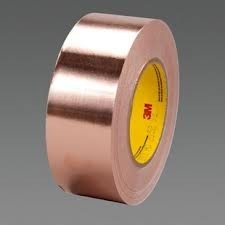 Owing to the rich industrial experience and expertise in this business, we are involved in providing Copper Foil Tape.